Hyatt Regency Bellevue is working on a $5.2 million renovation that promises to be the leading edge in tech-savvy hospitality. The three-part project, slated to be completed by the end of 2014, includes the revamping of the hotel’s lobby, a redesign of the pre-function and ballroom meetings spaces and a revitalization of 381 guestrooms in the Cascade Tower. 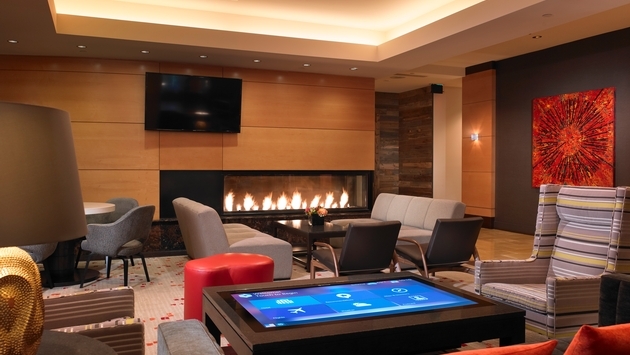 Highlighting the project: two 55-inch interactive touchscreen tables already in the lobby, inspired by Hyatt Regency Bellevue’s strong relationship with Washington-based Microsoft, Monscierge and Interknowlogy. Via the Windows 8-powered tables, guests can do anything from browse hotel and area information to play games to view flights to surf the Internet. Some rather interesting developments have spawned from the tech-centric tables, as well. Hyatt Regency Bellevue’s original lobby, D’Angelo noted, was your typical hotel lobby. It had a fireplace. It had classic furniture. It had a piano. It was “nice, classic, clean, but definitely not modern and not as inviting for today’s generation,” D’Angelo said. But the renovation has made the lobby into more of an interactive communications hub, so to speak. That vibe includes more interactions among guests, ironic given how some feel technology has pulled us apart. Now, it’s not uncommon to see someone from England showing someone from San Francisco his home in Manchester via the tables’ touchscreen maps, for example. The relationship with Microsoft has been critical to the project, D’Angelo noted. It all stems from a caring for people, something D’Angelo said Microsoft and Hyatt Regency Bellevue both share. The way you treat your employees is passed on to guests. Hyatt Regency Bellevue also came out with its own self-titled app via a partnership with Monscierge a few months ago. Guests can get detailed information about amenities, look at various maps, check out running routes though Bellevue’s beautiful area, order room service or bathroom items and view local recommendations for restaurants, golf courses, activities and more. On top of that, the hotel will be introducing several tablets for guests to use in the lobby by the end of the renovation. The rooms have already been equipped with extra ports for electronics. That’s in addition to the hotel’s lightning-fast Internet, which was a must for a hotel nine miles from downtown Seattle and surrounded by companies such as Microsoft, Google and Amazon. “There’s a lot of technology here in Bellevue and everybody needs to be connected,” D’Angelo said. But behind all of the technology lies a willingness to go a step further to help people. For more information on Hyatt Regency Bellevue, the recent renovations and current offerings, visit www.bellevue.hyatt.com.